Edward Braddock was born near Perth, Scotland in 1695. He joined the British army at the age of fifteen. He rose through the ranks and had become a major general by 1754. 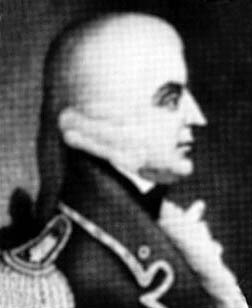 In 1754, Braddock became the commander of His Majesty's Forces in North America. His primary responsibility was to assist English colonists in driving the French from the Ohio Country. For the past several decades the English and the French had struggled for control of the area. Both countries wanted to win control of the lucrative fur trade with the American Indians of North America. Braddock arrived in North America in February 1755. In June 1755, Braddock and an army of 1,400 English soldiers and colonial militiamen, including George Washington, marched to the Ohio Country. Their goal was to drive the French from Fort Duquesne at the place where the Allegheny and Monongahela Rivers joined to become the Ohio River. Today it is the site of Pittsburgh, Pennsylvania. The French had completed the outpost a few years earlier and hoped to keep control of the region. By July 9, 1755, Braddock's army had moved to within seven miles of the fort. French soldiers and their American Indian allies ambushed the English force. Of the 1,400 English men involved in the battle, fewer than five hundred escaped alive and unwounded. Braddock received a mortal wound and died four days later. This battle was part of what would come to be called the French and Indian War (1754-1763). While the English lost this early battle, they eventually won the war.